1964-65 saw the merger of NSW women’s and Men’s Amateur Swimming Associations to be known as NSW Amateur Swimming Association. 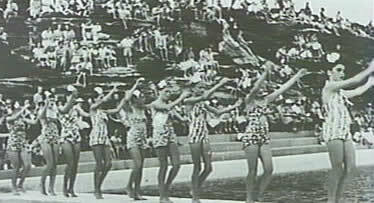 However for several seasons the segregated competition for various trophies within Warringah for male and female swimmers continued until such trophies were won by one of the clubs. In addition, a combined program was also conducted. The first President of the Association was Keith (Curley) Meakin of Freshwater Men’s Swimming Club. Competition was extremely keen as there were several excellent female and male swimmers in the area. The champions of the District from either Manly tidal pool or one of the rock pool clubs were coached by professional coaches, not necessarily in the area. In those early years Warringah could boast its share of International representatives in all facets of our sport, including diving, synchronized swimming, water polo, and swimming. A very comprehensive program of swimming events has always been on the calendar for WASA swimmers. 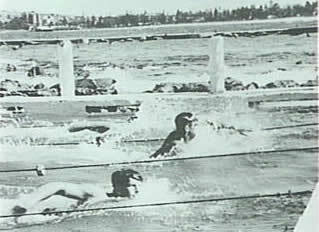 In the early years of the Association the heats of the Championships were conducted at Dee Why rock pool and many an official would get drenched with the waves breaking over the pool. The finals of course were conducted under better conditions at either Lane Cove pool but mostly at North Sydney Olympic Pool. 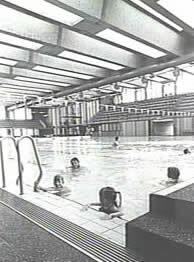 From the Associations inception there was a great desire to have an indoor swimming complex in our area. The Association set up a Pool Committee who over many seasons worked tirelessly with staff from Warringah Council in an endeavour to have a pool of good standard in the District. Consideration was given to sites at Narrabeen and North Curl Curl (where the bowling club is now situated) however in their wisdom the Council decided on its present location at Frenchs Forest. 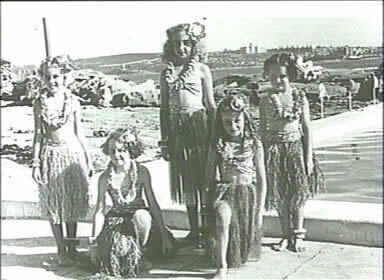 To celebrate its opening on 3rd November, 1979, Council requested our Association to organise the first carnival. This was done successfully with thanks forthcoming from the Shire president, Paul Courvert and Council staff. Over the years, swimming has progressed, as have all our sports, and we now have the indoor and outdoor clubs. The Association is mindful of this situation and has endeavoured over the years to cater for both the highly competitive and the recreational swimmers. Many of the rock pool swimmers also belong to the local surf clubs and nippers. A number, coached by professional coaches, are members of rock pool and competitive clubs. However, without these swimmers, the Association membership would be dramatically depleted. The 2007-08 season saw the withdrawal of two of the oldest clubs in New South Wales, Dee Why Men’s and Dee Why Ladies’, due to diminished numbers and the increased fees charged by Swimming NSW to affiliate members. Following the recommendations of The Crawford Report in relation to elite sport, Swimming NSW published a Strategic Plan. Among the recommendations was the re-zoning of Districts with planned Area rationalisation incorporating new competition models. In 2008,Warringah and Northern Suburbs were to be amalgamated to form one of four Metropolitan areas, Swimming Metropolitan North East. In 2009, WASA members voted not to amalgamate, Northern Suburbs having already made it clear that they too wished to remain autonomous. Swimming NSW then invited clubs within the new SMNE boundary to join the new Area. In 2010, our competitive clubs affiliated with SMNE. Several clubs decided not to re-affiliate their members with Swimming NSW, since the cost of increased affiliation fees would make their summer sport too expensive. The decision was taken to obtain insurance through a local broker and offer clubs a more favourable affiliation fee. Following WASA’s decision not to re-affiliate with SNSW, an amended constitution was passed. Fourteen clubs, including Curl Curl ASC which had withdrawn a few years before, affiliated with WASA for the 2010/11 summer season and a new era began, with the focus on family-friendly, recreational activities.